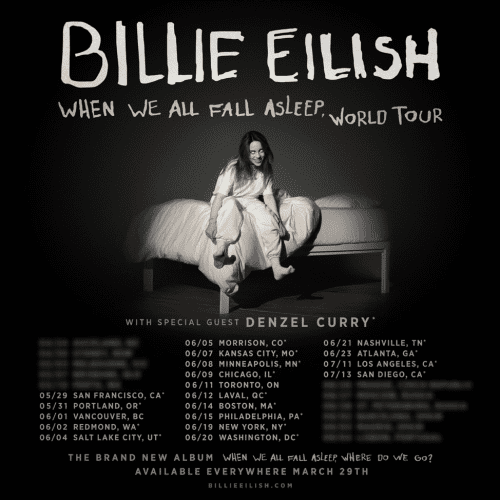 04 February 2019 (Toronto, ON) - Following the announcement of her forthcoming debut album, WHEN WE ALL FALL ASLEEP, WHERE DO WE GO?, and the release of her latest song and video for “bury a friend”, Billie Eilish has announced her WHEN WE ALL FALL ASLEEP WORLD TOUR, first revealing her North American tour dates for 2019. Starting in San Francisco on May 29, tickets for the nineteen-date headlining tour go on-sale Thursday, February 7for Verified Fan pre-sales and Friday, February 8at 12pm localfor general. To ensure tickets get in to the hands of fans and not scalpers or bots, the tour has partnered with Ticketmaster’s Verified Fan platform. Fans can register now through Tuesday, February 5th at 11:59pm ESTHERE for the Verified Fan presale. Registered fans who receive a code will have access to purchase tickets before the general public on Thursday, February 7th at 10am local time through 10pm local time. See Canadian dates listed below. Billie Eilish’s meteoric rise to global stardom has been nothing short of phenomenal and arguably unparalleled to date. Since her “ocean eyes” debut, Billie has quietly yet unapologetically infiltrated the forefront of pop. Thanks to a growing legion of loyal followers across the globe, an EP that has sat in the Billboard Top 200 for more than 18 months now and more than 5 billion combined streams globally, her tours have sold out consecutively around the world, Billie Eilish is ready to release her highly anticipated debut album, WHEN WE ALL FALL ASLEEP, WHERE DO WE GO?’, on March 29 via Darkroom/Interscope Records/Universal Music Canada, the country’s leading music company. Pre-Order the album HERE. WHEN WE ALL FALL ASLEEP, WHERE DO WE GO? was written, produced and recorded entirely by 17-year-old Billie Eilish and brother Finneas in their childhood home of Highland Park, Los Angeles. Recorded in Finneas’s bedroom opposite Billie’s, the pair spent most of 2018 writing songs on the road, then spending many days and nights when off the road, at home, recording the album. The first song to be revealed is “bury a friend”, which has since amassed more than 50 million combined streams since its release. The official Michael Chaves-directed music video also debuted last week and was the #1 Trending Video on YouTube with more than 23 million views to date. Watch the video for “bury a friend” HERE.